Yesterday I was thrilled to find this fabulous piece of woven cotton cloth in my local Vinnies. 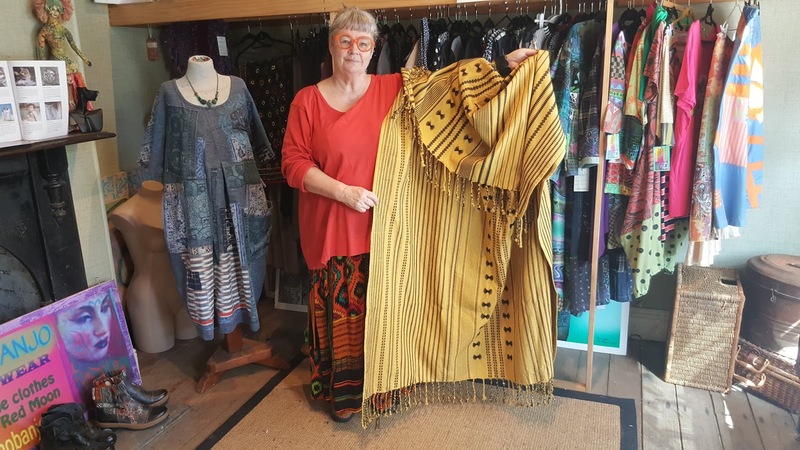 This 1.8m long piece of mustard and black fringed fabric cost $3. Hard to tell how old it may be and there was no label attached to identify where it was made. Usually these lengths are made in India but this one had such a distinctly tribal look I wondered if it might have been South American or African. However old it is, it's in perfect condition; unfaded, no stains or holes and probably never washed because the cotton is still has a stiff hand. The new pattern I'm working on is going to be called the Jorja Coat. 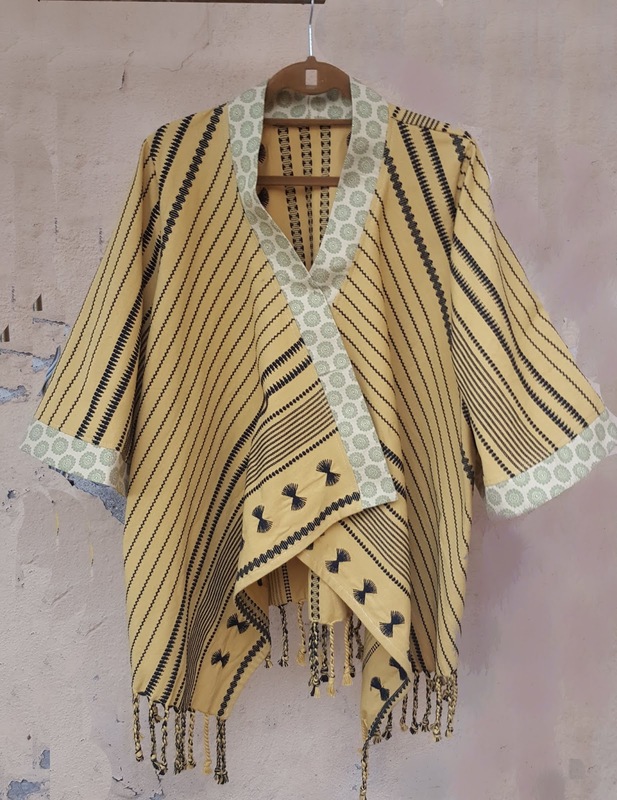 I've just finished a knit sample and this lovely mustard cloth seemed to have great potential for the next sample which needed to be in a woven fabric. I could see the potential to incorporate the lovely fringed edge along the back and fronts of the Jorja Coat. 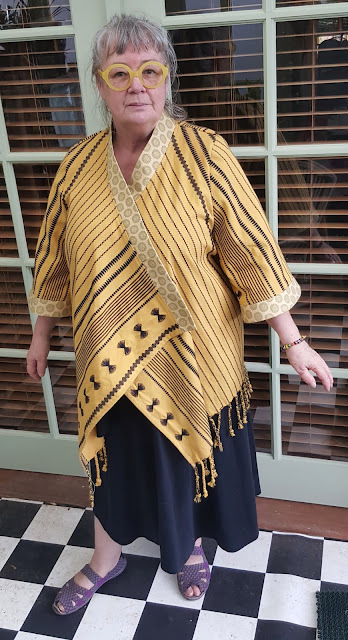 After cutting the fronts and back in the mustard cloth I needed to choose a contrast fabric for the sleeve and front bands....black seemed the logical choice....as usual. 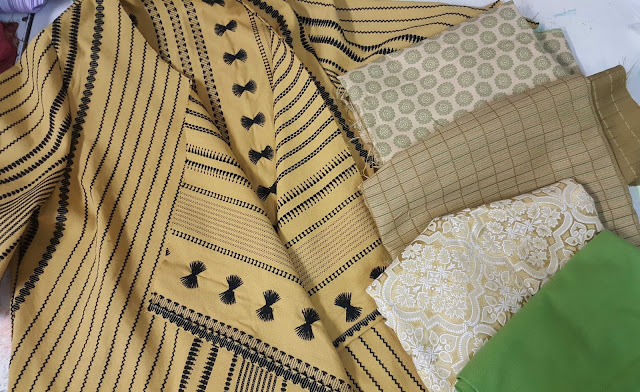 Because it seemed such a predictable choice I decided to take a risk to try something different and pulled out a selection of pieces from my collection of vintage upholstery fabrics. I picked out the tapestry at the top of the picture below that has the small circular motifs to cut as bands. 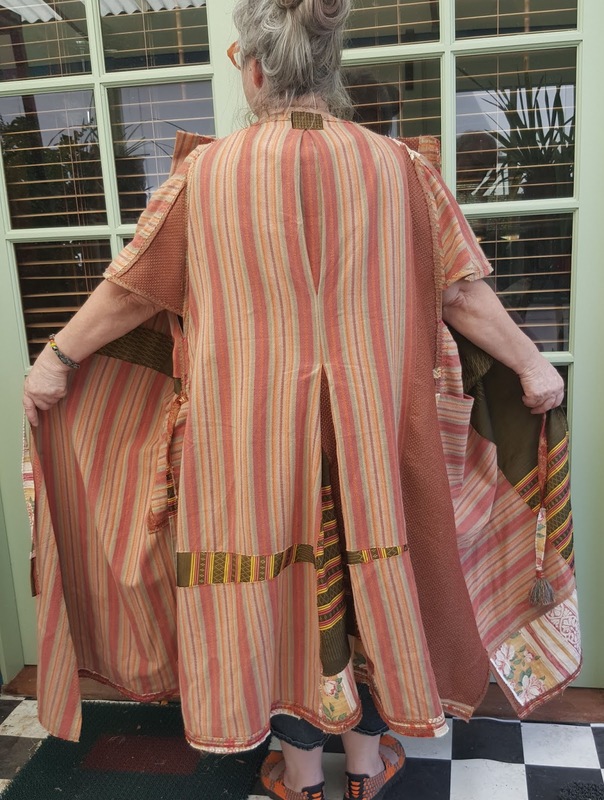 Below are pictures of the finished Jorja Coat in the woven fabric. 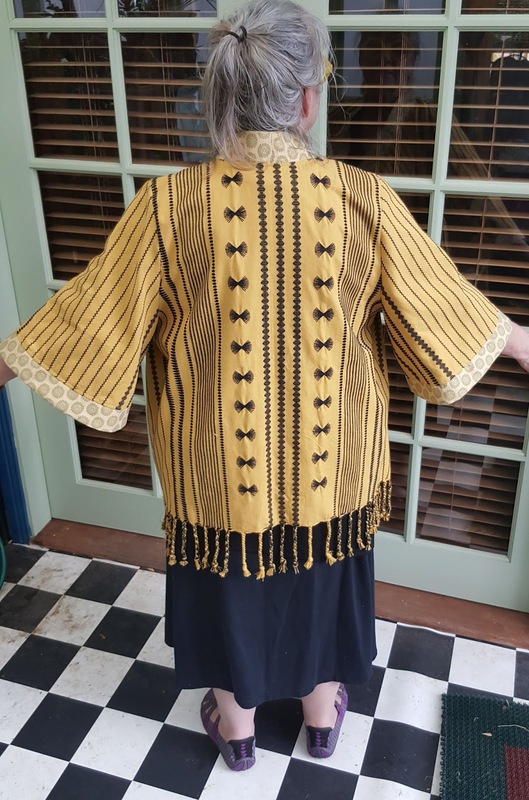 I was really pleased with how cutting the natural fringed edge of the original fabric made a wonderful feature on the finished garment. I was also pretty happy with the bands. Just a reminder!...the cloth and bands that the coat is made from are both thrift shop salvaged fabrics that cost less than $4 in total. The result is a unique art to wear garment that is durable enough to be worn for decades. 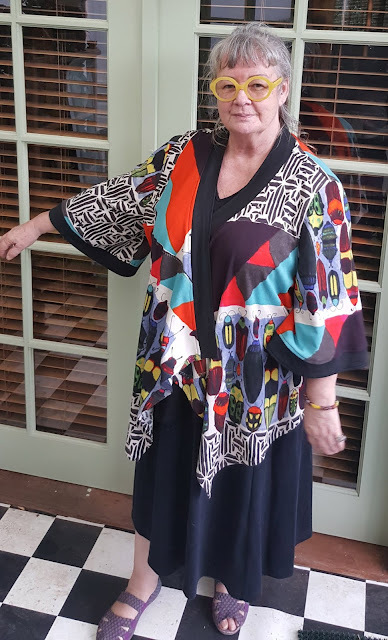 When I saw the dress being promoted on Instagram I was immediately taken with it because it was a zero waste pattern and my personal dressing aesthetic is always drawn to styles that are eastern and tribal. 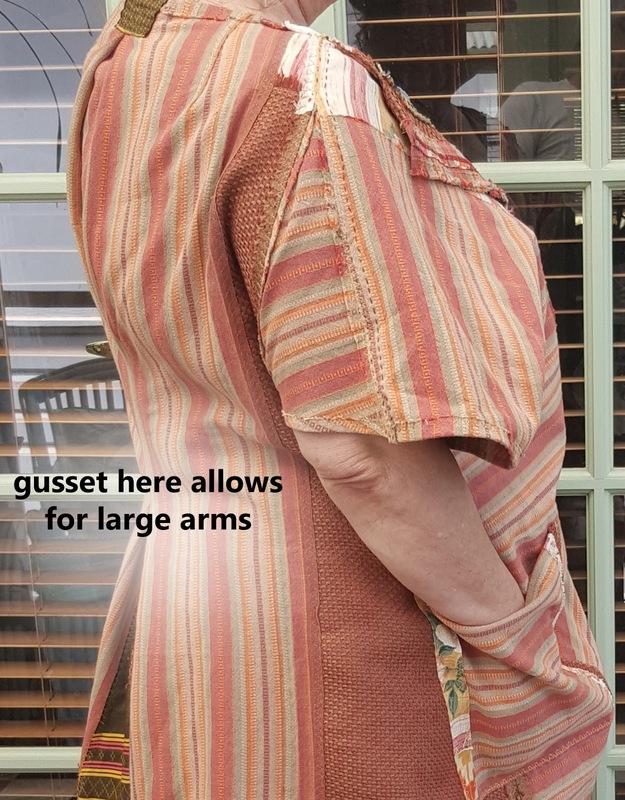 When the designer suggested it may need to be altered to suit a wearer of less than 5’5” (162cm) in stature this was another challenge to rise to as I’m 5’6” (165cm) and a bust size larger at 120cm than the largest grade the Maynard is published for. So essentially my figure is – 6”(15cm) shorter and 6” wider than what the dress is best supposed to suit…heh! we shall see! The instructions are some of the best I’ve ever seen and the many diagrams are large and technically perfectly illustrated. Lauren writes in clear language that is right to the point for each step of the construction. For those new to the concept of “zero waste” the pattern sheet might look quite confounding! 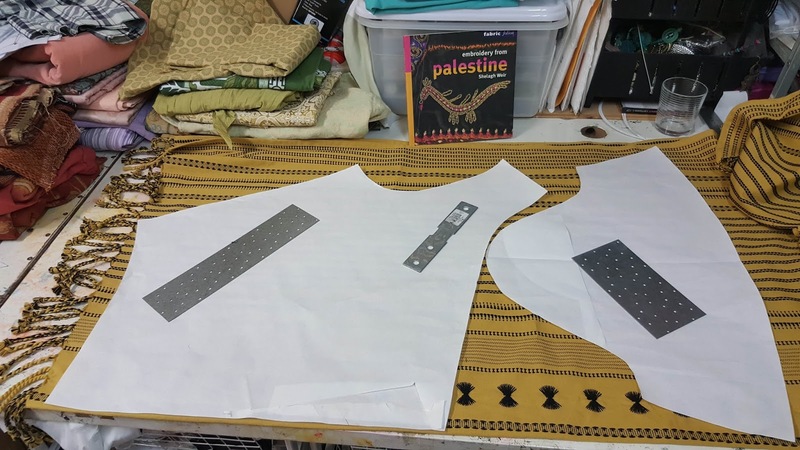 However, it is well explained how to apply it to the fabric and how to cut. 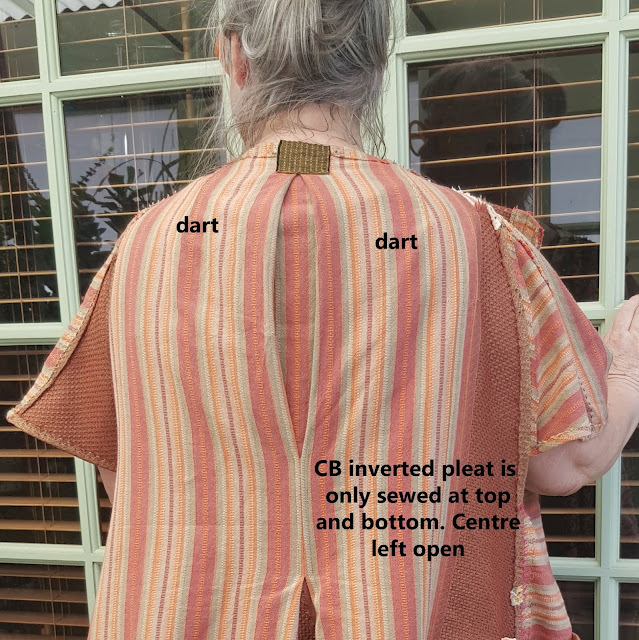 I did actually diverge from that and cut my pattern into the sections because I wasn’t using a flat, smooth, continuous piece of textile under the pattern. As outlined in my previous blog I patched fabrics together to make the rectangle of 216cm x 140cm wide that was needed. This made it hard to transfer the markings and chalk lines because my fabric was lumpy and textured with seams so cutting the pattern sections apart to mark them was a more practical method. 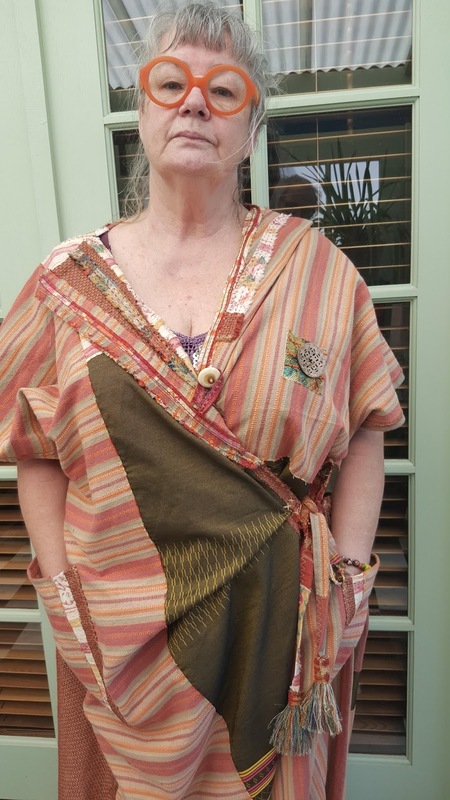 I didn’t add any allowances to the side seams for 2 reasons - I knew there was a lot of natural ease allowed for and because I wasn’t going to sew conventional seams which would have taken up 2cm. 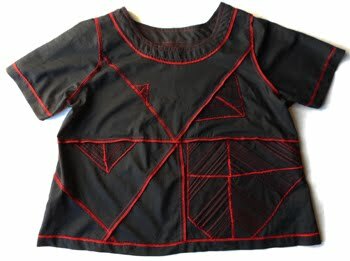 I used my overlay and sew with 3-step zigzag method which allows for controlled fraying of the cut fabric edges. The seams are only overlaid 1cm so that was going to create a few extra cm of ease all around. The fronts were constructed as per the pattern without alteration. However, I did add a large triangle gusset at each back shoulder arm opening to allow for my rippling biceps. This an alteration the designer takes into account that may be needed by some people and it is well explained how to go about this. I found it easy to do and a very satisfactory solution to getting a good fit at the armhole. 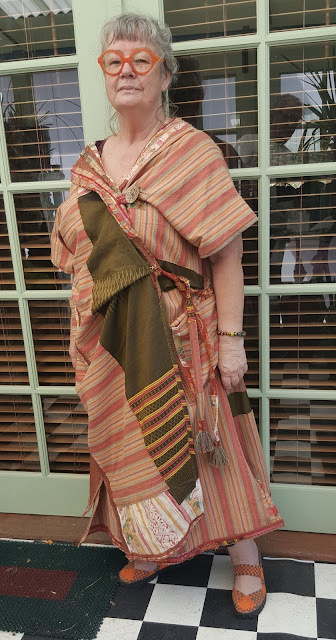 The length suits me just fine, hemlines above the ankle and at lower calf are my preference so I didn’t add anything to the original pattern. I did sew a button high on the left breast and a loop to the edge of the right front so it could be looped up to hang off the button. 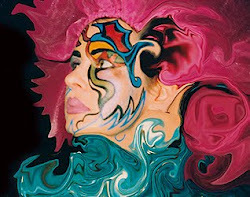 This was done just because I like the folds that are created by doing that and served no other practical purpose. The dress folds very well over the bust and didn't require any closure for modesty. 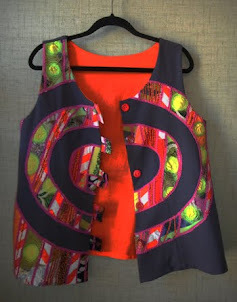 In the picture you can see another button at the centre front, but once again that was only added for embellishment. Where the dress crosses over it stays and doesn't need any assistance from closures. 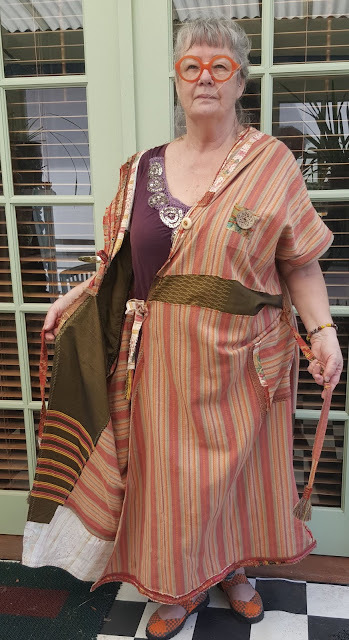 I finished the hem by turning it to the outside and over sewing it with all the tiny little strips that were cut off the sides of the fabric when the pieces were cut out at the beginning. This may sound quite ditzy but I really liked the effect. Over time, as the garment is worn and washed I hope that lots of fibre will fray off to make it like a fuzzy braid. I like the garment worn either as a dress or loose and open as a coat. I will sell this first version of the Maynard but are definitely planning to add several versions in the future to my own wardrobe.